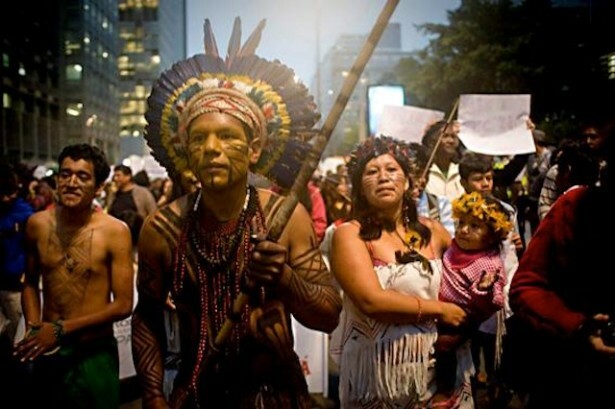 The indigenous Guaraní people of São Paulo begin a campaign for the demarcation of their territories. In Brazil, April 19 is “the Day of the Indian,” a commemoration imposed by whites in Brazil to supposedly remember the importance of indigenous cultures for the country. But the indigenous Guaraní people of Brazil have nothing to celebrate. “That was the day we got used to being deceived,” said members of various Guaraní communities living in and around São Paulo. As a result, this month the communities launched the “Guaraní Resistance” campaign to demand the demarcation of their traditional lands and to demand that the current Minister of Justice, José Eduardo Cardozo, comply with his constitutional obligations and guarantee the return of their lands. “For us, ‘the Day of the Indian’ will be the day in which Minister Cardozo signs the demarcation for our traditional lands,” one member of the resistance campaign explained. Nearly 2,000 indigenous Guaraní live in São Paulo, distributed throughout a city where the lack of space and lack of respect for indigenous land rights makes it impossible for them to develop their culture. Although in the 1980s the government formally recognized three traditional land zones belonging to the Guaraní in São Paulo, the land the communities were offered was never enough for them to support daily life and traditional culture. Two of these three demarcated zones are each one-tenth of a square mile, and one is even smaller. At the beginning of April, the indigenous communities from Tenondé Porã and Jaraguá in São Paulo began to speak out and pressure Justice Minister Cardozo to recognize the Guaraní’s traditional territories so that they may be returned. They began collecting signatures through an online petition and they sent a pen as a gift to the minister, decorated with traditional Guaraní designs. Furthermore, for each signature collected, they sent a pen to his offices in Brasilia, Brazil’s capital. As of today, the Ministry has received more than 2,500 pens. On April 16, representatives from various Guaraní communities peacefully occupied a building in downtown São Paulo called “Pátio do Colégio.” In 1554, it was the first building built by the instruction Portuguese Jesuits in the city of São Paulo. The building’s goal was to convert indigenous people in the area to Christianity. The structure itself was built largely by indigenous and African slave labor. The peaceful occupation on April 16 was a symbolic occupation to give visibility to the Guaraní’s demands — and the long history of land theft and colonialism in Brazil. “It is not about revenge or deceit as they did with us,” one participant declared during the action. “They already robbed the space from us a long time ago, and we are not going to ask that they return it, since these lands are no longer the ones that are now in the center of the city.” Today, the indigenous people live on the margins of the city where there is still some of the forest where they once lived. The following day, Guaraní participants reconvened in front of the Pátio do Colegio to speak about the current struggle for land in the city and to strengthen ties with other social movements in São Paulo. Members of the Passe Livre movement, which fights for free public transport; members of the Copa SP Popular Committee, who speak out against the impacts and human rights violations resulting from the 2014 World Cup; and members of the Movement for Landless Rural Workers and the Justice and Peace Commission of São Paulo were all in attendance. On April 24, members of Guaraní communities plan to march peacefully through the city’s downtown to demonstrate once more that the Day of the Indian is one of struggle rather than celebration, and that the communities demand the land be returned to them so they can continue their way of life. In the coming months, Waging Nonviolence will be following the demands and protests of indigenous organizations in various states across Brazil, as well as the social movements surrounding the 2014 World Cup.